Outstanding shot! 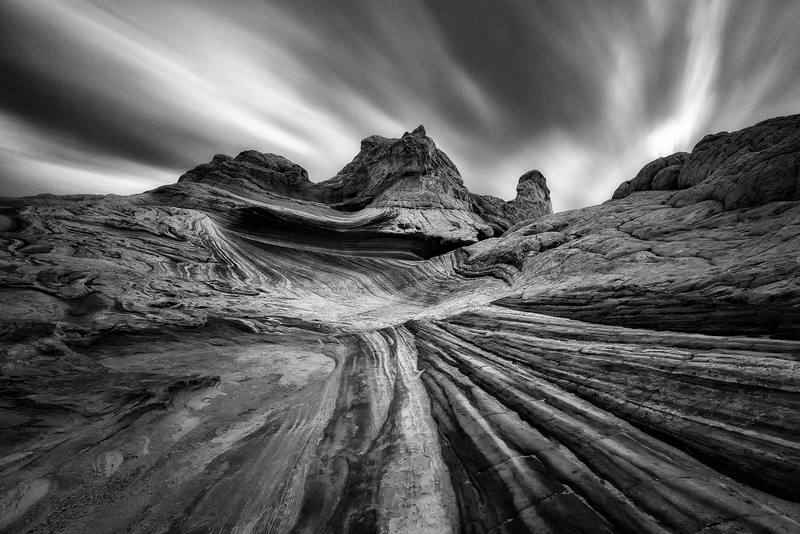 Very clever use of the fluid action of the clouds in (similar) contrast with the sweeping lines of the unusual rock formations. Great shot! And all the better for being rendered in monochrome. Loscar, I really enjoy the textures and composition of this image. Well done! I bet it looks great in color as well. Thank you for sharing. Joe Sr.
Fabulous photo Loscar; it was cool to see the image on the back of your LCD right after capture and even more stunning after you added the finishing touches. Wonderful Photograph and fast thinking to use the clouds and tools available to you. I’ve seen this shot in color also and it looks great. Thank you for all your kind words and comments Chris, Joe, Anil and Bob, I really appreciate them all. Thank you Joe and RRS for this opportunity. Simply a great photo. I am very impressed with it. Two questions, 1. How did you get there, hike, SUV, horse, Fly-in? 2. Just where does one get a 10 stop ND filter? Looking at the North – South pointing of the White Pocket formation, did you shoot from West to East or East to West?